“We are on the verge of determining the frequency of Earth-like planets in the Universe”, says Alan Boss, a key scientist on the Kepler space telescope. Kepler was successfully launched this month (March 2009) into an Earth-trailing orbit around the sun, its mission to seek out a clutch of new low-mass exoplanets, impossible to spot from the ground. The ultimate goal is, of course, the first discovery of a small rocky planet orbiting a sun-like star within its habitable zone: a Second Earth. Boss believes such Earth-like worlds are common in the galaxy, and hence life itself to be ubiquitous, although he offers no discussion as to why he has come to believe biological emergence to be an all but dead-cert event on any wet planet. What unfolds across the pages of Crowded Universe is an exhilarating first-hand account from the front-line of the race to discover the first truly Earth-like exoplanet. The story picks up pace as more and more exoplanetary discoveries are announced, with the observational astronomers forced to constantly refine their technique to stay ahead and planetary system modellers struggling to explain the new data. The high stakes of multi-million-dollar space missions and the constant political struggle to keep them funded are also well described by Boss. Of particular interest is the account of the race between American and European planet-hunting teams. European efforts discovered the first exoplanet around a main-sequence star and were first to launch a space telescope capable of detecting an Earth-mass planet, COROT, but the West-of-Atlantic teams are hot on our heels. My only major gripe about the book, however, is more to do with an editorial decision on the writing style. The entire book is written as a series of dated sections, starting in February 1995 and bringing us right up to date in September 2008 with the decision on the launch date for Kepler. This strictly chronological structure does give a sense of narrative development and progress as scientific discoveries roll-in and major decisions are announced over the course of the book, but many of the reports are offered without background explanation or context and overall the book lacks cohesion. 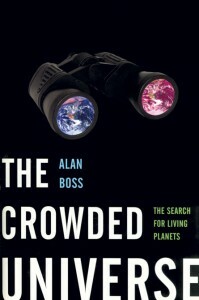 Crowded Universe would be a great resource for a historian of science, but is difficult to piece together reading as a general armchair book — it often feels as if Boss has simply lent you his personal note-form diary entries to flick through. The book offers a fascinating insight into the exoplanetary community and the thrills and disappointments of intensely-competitive scientific research, but I wouldn’t recommend it as a first text to introduce you into the topic.